Google Analytics Adds Real Time Reports, Improves Custom Site Search – Search Engine Watch (#SEW). A couple new and noteworthy Google Analytics features were announced last week. First, Google has added real-time reports to monitor visitors actively looking at your site. Also, for sites with their own custom search engine, Google Analytics has made it easier to integrate data into your analytics reports. For years, Google has lacked a real-time element to its Analytics product. That changed as Google released real-time analytics reports to a limited set of people. While Google Analytics will still process results on their 24-hour lag, a new set of reports will now show activity happening on your site as it happens. The reports show active, changing graphics, detailing page views per minute and per second. Detailed reports include percentages of active visitors by country, by page currently being viewed, and by the visitor’s source, including custom campaign tags. While the data is limited, of the best ideas for use so far is to use it to see campaign tracking when unrolling a new campaign. Because of the way data is collected and the delay in its processing, many times a simple typo can make your data go awry and take at least 24 hours or so for you to discover. With the real-time reports, you’ll be able to see anomalies quicker. The new real-time reports only are available in the new version of Google analytics. Look for it under the Dashboards area this week. When the new Google Analytics interface rolls out this week, you’ll be able to find it under the Home tab. If you can’t see the reports and don’t want to wait, you can request access sooner. Site search reports have already included more than mere usage and search terms. Now the set up processes are easier. Essentially, you simply navigate to the Custom Search Engine management page. From there, select a few options, including options specific to Google Analytics, and the Google Custom Search tool will produce your new, analytics-friendly code, ready for copying and pasting into your site. To be clear, this is really an announcement more concerned with Google’s Site Search product. However, if you use it or were considering using it, know that setting up the Google Analytics reporting components is much easier now. The new Site Search code enables all the cool tagging and integration for Google Site Search clicks to interact properly with Google Analytics. As part of the process, you’ll need to select which Google Analytics account you intend to use with each individual site search engine you create. The Google Analytics team has been quite busy of late. Just last month, Google Analytics changed the way they counted visitors with modified session data, which led into new multi-channel funnel reporting. Infographic: Google’s War Against Spam | WebProNews. Top Google Ranking Captures 18.2% of Clicks [Study] – Search Engine Watch (#SEW). 6.44 million from the U.S.
Chrome Gains Ground in Browser Wars – Website Magazine – Website Magazine. Google Chrome surpassed 20% of the global internet browser market during the month ofJune 2011 according to Internet statistics firm StatCounter. Chrome took 20.7% of the global market, up from 2.8% in June 2009. 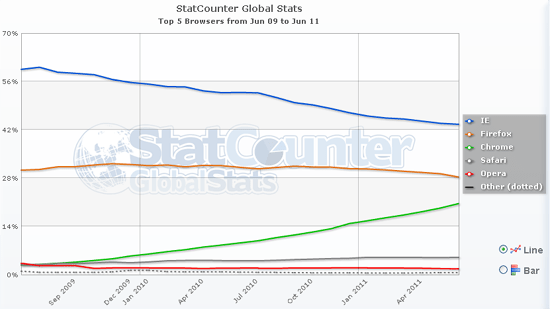 Microsoft’s Internet Explorer has fallen from 59% to 44% globally and Firefox dropped slightly from 30% to 28%. Boost Your CTR With These 5 PPC Ad Copy Strategies – Search Engine Watch (#SEW). Strong creative can be a huge competitive advantage in the world of paid search. When you can pay less to get more, you’re doing something right. The compounding factors of improved CTR, increased quality score, and reduced CPC can make a tremendous impact on performance. Ad copy testing lies at the heart of seizing this competitive advantage. With an endless number of attributes to test, it can be a little daunting to pick a starting point. Looking for a positive impact? Here are five ad copy attributes you can test. If you’re a retailer, this is must. You’re missing out big if you aren’t testing into specific price points and percent off offers. A 76.5 percent CTR lift on the higher price point. We can make assumptions as to why the higher of the two price points experienced the higher CTR. Maybe the “or Less” factored in, or maybe “$39” just sounded too good to be true. Hard to say. This is precisely why we test. By now you have hopefully enjoyed the benefits of running Google Sitelinks in your ads. The presence of ad sitelinks can lift CTR by more than 30 percent. Surprisingly, many advertisers still haven’t added these to their campaigns. Maybe they’ve tested it and found that their ads perform better without sitelinks, but this is doubtful. I haven’t seen an instance where an ad’s CTR decreased as a result of having sitelinks present. Don’t let your sitelinks get stale. Remember to rotate in new pages to test, and test variations of the ad copy. Keep refining. Using “Official Site” directly following the name of the brand in the ad headline has almost always lifted CTR and reduced CPC. There is an absolute correlation between the power of the brand and the influence that “Official Site” will have on improving performance. Recognizable brands that carry more weight will typically benefit from this. In instances where there are many affiliates competing in the space, the brand will also benefit from this tactic. “Brand Name – Official Site” can also lift performance on non-brand terms, especially in instances where the brand is considered a leader. Depending on your account, it may be worth experimenting with this. With the recent modification of Google displaying the root URL of the display URL within the headline, there’s been speculation that “Official Site” many not be as necessary as it once was, and those valuable headline characters can be better utilized. Sounds like another great test! Any good direct marketer understands this principle. Give consumers a reason to feel as though they should decisively take action, and they are more likely to do so. This is another recent modification to how Google displays ads. You no doubt have seen this, and hopefully have been experimenting with it. Ultimately Google will make the call on whether your description line #1 will be moved into the headline of your ad. While you can’t explicitly opt into (or out of) this, you can influence the probability of your ad displaying as such. First and foremost you need to be in the premium position above the organic results. By crafting your ad so that each line of copy appears as a distinct sentence that ends with proper punctuation, you’ll at least be in a position to have your ad appear with the extended headline. Applying some of the tactics mentioned earlier, like sense of urgency or price points, into the extended headline can help boost CTR and is worth experimenting with.